– Average Queue Times: Dependant on when you arrive for a show. Coming off Mainstreet and entering Adventureland the Polynesian inspired Tikki Room can be found immediately on your left. It was the first ever fully audio-animatronic show in the world, with over 250 animatronics, half of them capable of singing. The Tikki Room theme was written by Disney Studio’s famous Sherman Brothers and tends to get stuck in your head. Here it is below. Upon entering the Tikki Hut, you settle into the pew like seats and are greeted by your four friendly bird hosts, Jose, Michael, Fritz and Pierre. After singing the theme song, the birds then lead you on a musical adventure featuring some traditional Polynesian folk songs. Through each section of the show more parts of the room come alive with singing birds, flowers and masks. Eventually the entire room is singing and dancing with a rendition of the “Hawaiian War Chant” and you come away whistling the theme song. Good times. Inside the Tiki Room Pre-Show. Photo Courtesy of Vinylmation. This attraction is a real toss of the coin. I’ve got it down as obligatory, mainly because it is a Disneyland institution. Some will hate it, some will love it. I’m in between due to the history and innovation involved but would only go on once a trip (if that). Entrance to the Jungle Cruise. Photo Courtesy of Disneyland. – Recommendation: Must do for all ages. 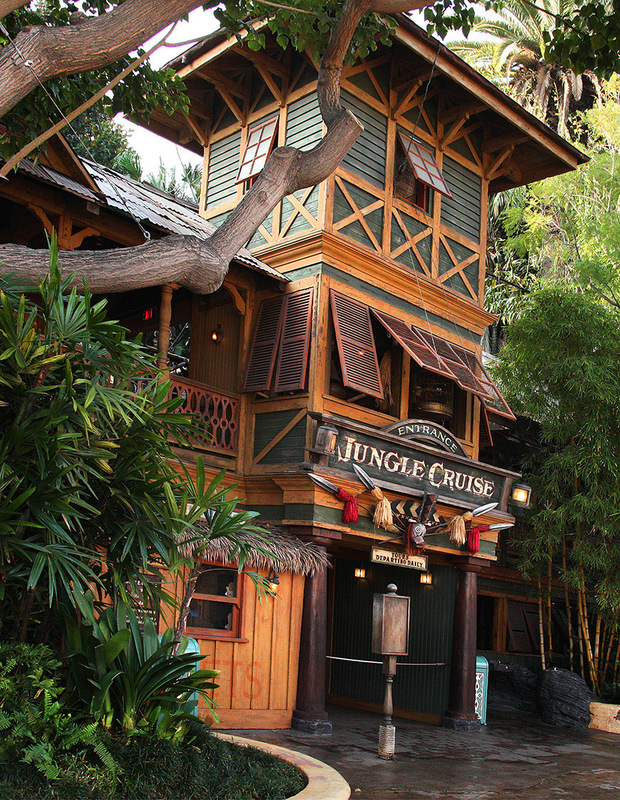 The Jungle Cruise is one of the most famous attractions at Disneyland. It is an immersive escape through the jungles of the world, from South East Asia to South America, which aside from the occasionally broken animatronic, is quite realistic. Most of the trees you see were carefully selected and planted by Disneyland landscaper Bill Evans during the original build in 1955, resulting in a dense jungle atmosphere that blocks out the sights and sounds of Disneyland. As you board the safari boat on your perilous, guided tour of the worlds most dangerous jungles, you are greeted by your skipper, who’s terrible jokes rival any visiting dad’s. The journey begins in South East Asia, with views of animatronic tigers, water squirting elephants and a former camp destroyed by monkeys. Soon enough you find yourself on the Nile river, where classic African Safari animals can be found. To finish your journey vicious Amazonian headhunters and a school of piranhas attack your vessel. Assuming you survive your journey, the Jungle Cruise drops you off safe and dry…unless you fall in. Another institution at Disneyland, The Jungle Cruise is a sensational attraction, especially considering it’s age. 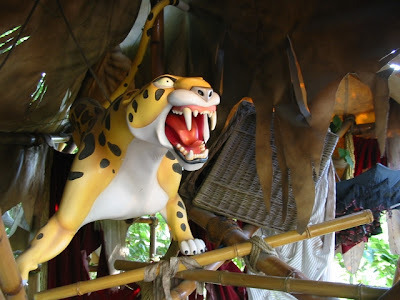 From the hundreds of animatronics to the jungley (real word) atmosphere. You probably shouldn’t miss this one. *Spoiler Alert: Below is the full POV (Point of View) Video of The Jungle Cruise, thanks to SoCal Attractions 360. Just the beginning of the awesome queue. One of the only really positive things Michael Eisner did, while in charge of Disney Parks was to work closely with George Lucas and commission this ride. The Indiana Jones Adventure opened in 1995 and is amazingly unique. It incorporates detailed theming, special effects and excellent ride technologies to give you a really thrilling experience. Even the queue to get on the ride is extremely detailed and interactive, so is probably the best one not to get a Fastpass for (initially). When you hop on board your Jeep shaped ride vehicle for the first time, you really have no idea what to expect. To prepare yourself for what it might be like, just think of the first scene from Raiders of the Lost Ark but triple the tension. You begin your journey by looking into the cursed eyes of a Cambodian looking statue and all hell breaks loose. You will encounter fire, snakes, blow darts to the face and even “the rolling boulder”, which you of course escape, with a stomach churning drop. All this while Indy does all the actual rescuing. The ride ends and once again you have survived another Adventure. The ride vehicle in motion. Picture courtesy of Trip Savvy. From the queue to the quest, this attraction is a definite MUST DO (For those who meet requirements)! While Your “Enhanced Motion Vehicle” (EMV) tosses you around the entire ride, to simulate the rough terrain, it never really feels too rough. 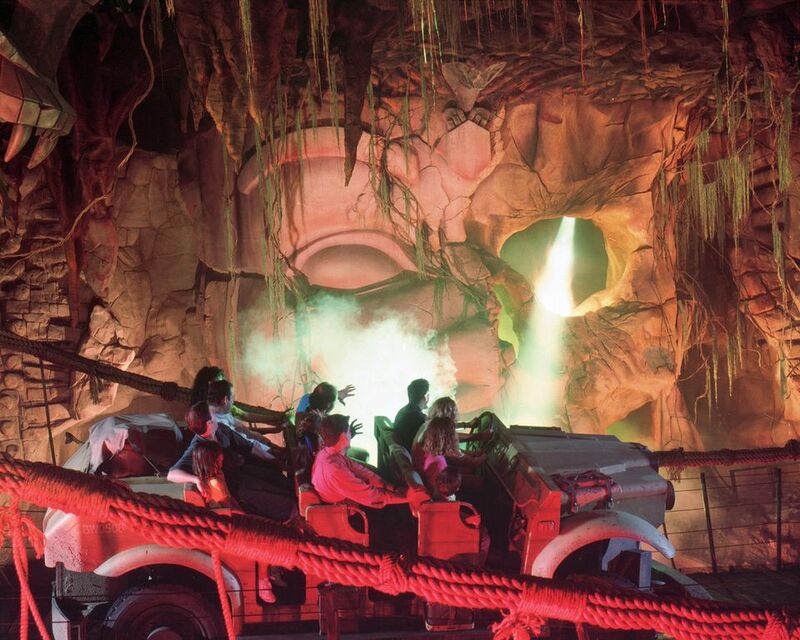 Moreover, Disneyland, along with Tokyo Disney Sea have the only Indiana Jones Rides of this type. Get on it! Spolier Alert: Below is the full POV video of the Indiana Jones Adventure. Video thanks to LMG Vids. – Attraction Duration: Max 10 Minutes. – Average Queue Times: No Queue. 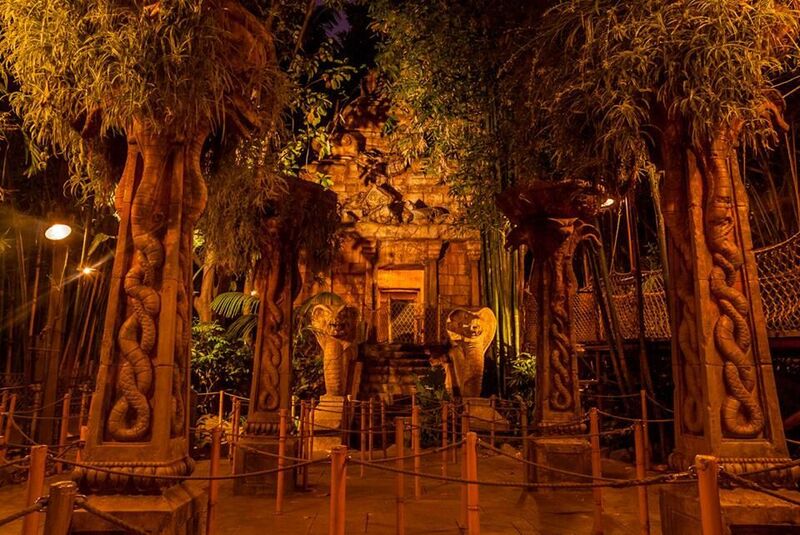 Previously known as the Swiss Family Robinson Tree-house, Tarzan’s Tree-House opened in 1999, the same year as the animated film premiered and is a perfect exponent of the term synergy. It is situated on the border of Adventureland and New Orleans but can not really be seen from the Square. 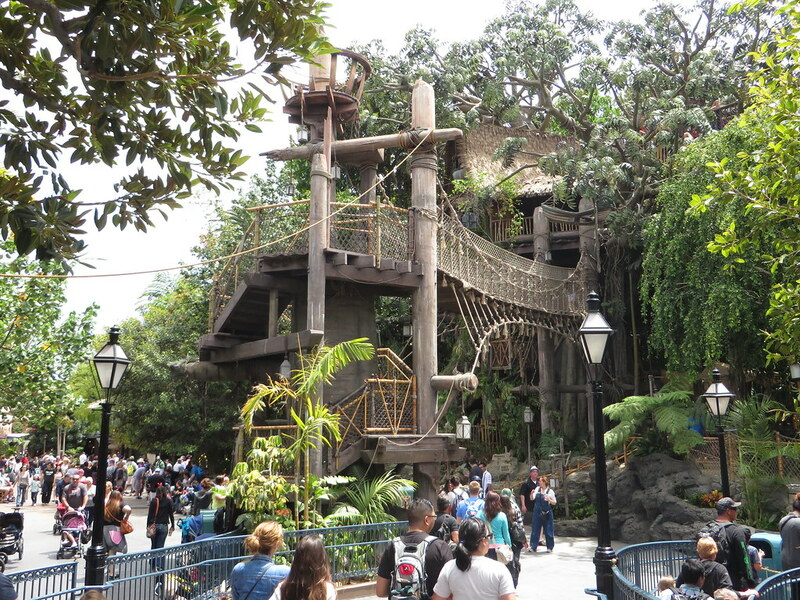 Tarzan’s Tree-house is literally a walk up attraction with no queue. Climb the stairs, cross the rope bridge and you’ll find large scale figures of characters and wild animals from the movie. There’s old furniture strewn about and sound effects played throughout. It is quite detailed and well laid out with plenty to explore. Climb down the stairs on the opposite side and you’re done! Inside the Tree-house. Photo Courtesy of Houses of Wax. This is a may as well attraction. It is a great little playground for kids between 6-12 years of age, as there is plenty to explore. The best part is there is no queue, so it is perfect for something to do as part of a wait for a Fastpass Return (Indy maybe?). The Land of Adventure is a great little land, filled with plenty to see and do. It is just a question of whether all of these attractions appeal or not. I can’t imagine anyone finding at least something they won’t enjoy here. Adventureland’s attractions receive a combined 7/10 for me.